Expectations meet reality when companies have to show their cards during earnings season. While the hype surrounding the legal cannabis sector has been enormous, pot stock earnings reports crushed expectations. On Monday (March 18), Tilray Inc. (NASDAQ: TLRY), one of the biggest names in the marijuana industry, smashed investor expectations when it announced a stellar first quarter earnings report. After all, Tilray is a leader in North America’s explosive $12 billion marijuana industry. But Tilray isn’t the only marijuana firm raking it in. 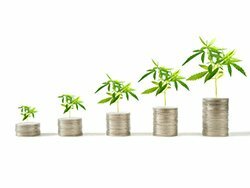 We combed through the earnings reports of the three biggest cannabis stocks on the market to show you just how lucrative this industry is. This numbers from Tilray’s earnings report are staggering. According to its earnings report, the company’s quarterly sales grew to $15.5 million, up from just $5.1 million a year ago. That’s a 203% revenue increase in just one year. And it beat even the most aggressive analysts’ expectations, which estimated the company would earn just above $14 million. These numbers are a clear sign that Tilray is growing like a weed. It also bodes well for the growth of the marijuana industry in general. Just take Aurora Cannabis Inc. (NYSE: ACB) for example. In 2018, Aurora’s earnings report showed it brought in CA$54.2 million during the 2018 fiscal year, nearly quadrupling its revenue year over year. Now, Wall Street thinks the company’s future returns are going to be exponentially greater. In fact, for the first quarter of 2019, analysts expect the company to nearly beat its entire 2018 revenue, estimating CA$54.6 million in revenue for Q1 2019. That kind of return is going to result in year-over-year sales growth of between 200% and 500% for the company.